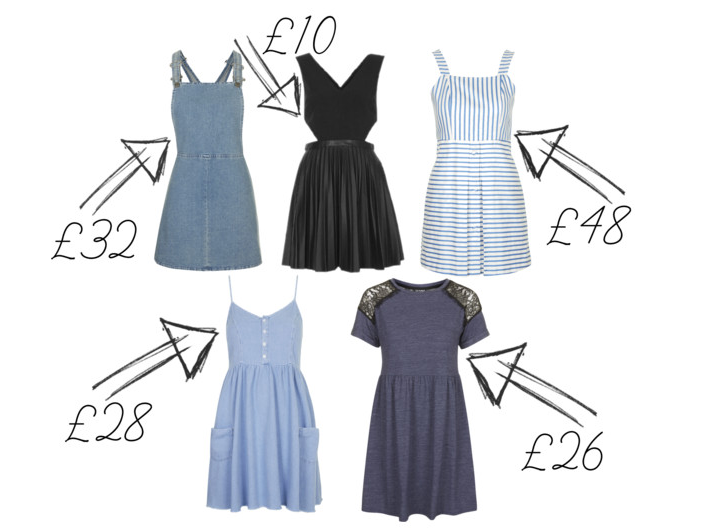 So, if you haven’t realised yet, I have a bit of an obsession with Topshop(even though the last few times i’ve been in my local one, there’s been nothing in there, grr), so I decided to make another “Top 5 Right Now” post but with dresses instead of jackets! I promise I didn’t pick a blue theme, it just sort of.. happened? First up is this adorable Vintage Wash Pini Dress that’s available online now for £32. It definitely not something I’d have picked out for myself even six months ago, but after seeing all the model photos on the website being paired with a simple white tee and chunky black boots and having a strong nostalgic flash back of 6 year old me, I just got such a spring-y vibe, I knew I had to have it! What do you think of this style? The only non-blue item in this post today is such a bargain! It’s down from £50 to just a tenner, bang! Another slightly questionable piece, this Pleated PU Skater Dress, caught my eye at first because of the triangular cut outs but then I was slightly put off, for about five minutes, due to the pleather skirt, as i’ve never worn anything like it before, but then it hit me, why not? I had no solid reason to dislike it and for £10, I couldn’t not at least think about it, right? Getting a bit more summery now, what do you think of this adorable Striped Pinny Sundress? They say you should never wear horizontal stripes on your bottom half but seriously when was the last time you saw a dress with vertical stripes on the bottom? I love the nautical feel this little piece has, pair if with a short sleeved, white cardi and a pair of cat eye sunnies and you’ve got yourself a super cute summer look! You can grab it now for £48. Another summery one and possibly my favourite of the five, I think this Bleached Washed Babydoll Dress is gonna be a wardrobe staple for many this summer! The first reason being that babydoll fits are so flattering and comfortable and secondly, I think denim is going to make it’s biggest come back yet this year, but we shall see my lovelies. It’s available right here for £28. Last but not least is this adorable(do I use this word too much?) Lace Insert Flippy Dress. I don’t know what I like more, the lace inserts on the shoulders of the fit. I’m pretty sure if I did buy this i’d live in it, no shame. A great bargain at £26.